Cooking for Fun and Friends! 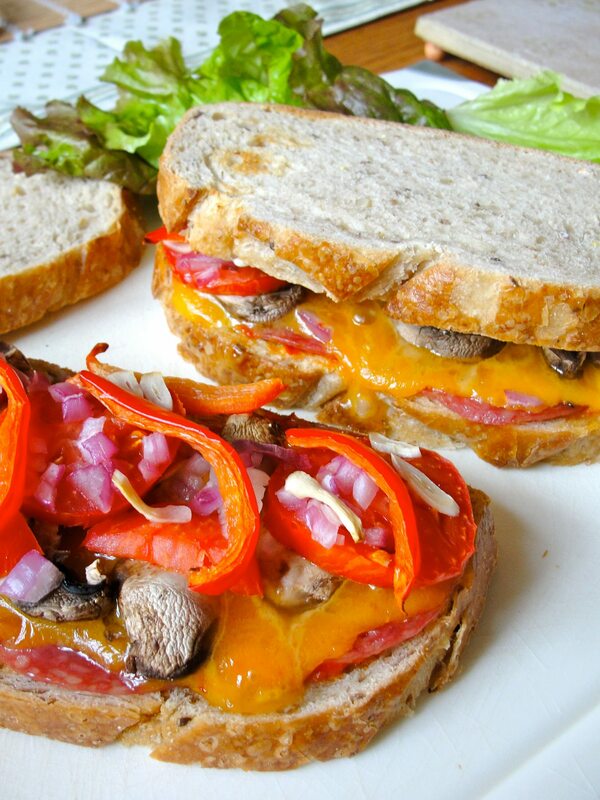 This is a great sandwich that I make quite often; I don’t have a panini press, so I bake it instead. I start with a thin layer of relish or sauce (here I used the Red Pepper Spread from Trader Joe’s), but tomato paste or hummus is also good), on multi-grain sourdough then a single layer of salami slices, topped in order with sharp chedder, fresh sliced mushroom, thinly sliced roma tomato, then some red onion, red pepper strips and thin slices of garlic. Tip: its best to put cheese and mushrooms first so they don’t overcook, and the peppers/onions/garlic at the top to receive more direct heat. Bake open-faced, on a baking sheet in a toaster oven or conventional oven at 300-350°F for perhaps 15 minutes until the cheese is well melted and the garlic slices or vegetables on top just begin to brown. Top with another slice of lightly toasted bread, perhaps with a bit of mayonnaise and/or hot sauce if you like! Welcome! I hope you're hungry.